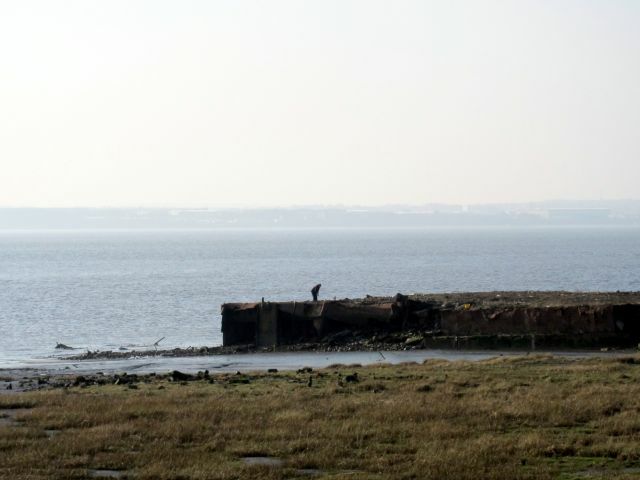 We’re still enjoying days of crisp, February blue skies, so when I had to get something from B&Q on Speke Retail Park, I decided to take our dog and walk a stretch of the Mersey estuary shore I hadn’t explored before. Two minutes drive from the bustle of the shops and the roar of traffic along Speke Road there’s a hidden pocket of wildness and Edgeland strangeness. 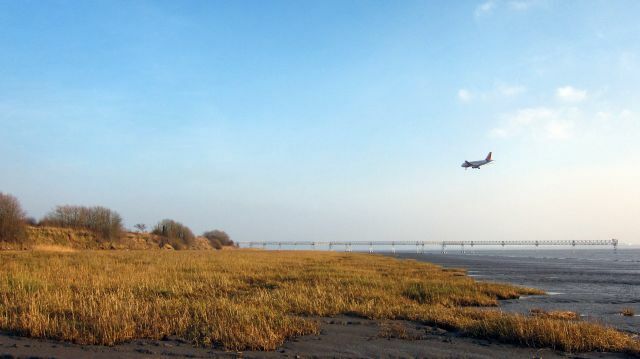 Speke-Garston Coastal Reserve is a haven of tranquillity carved out of the old Speke Airport site. 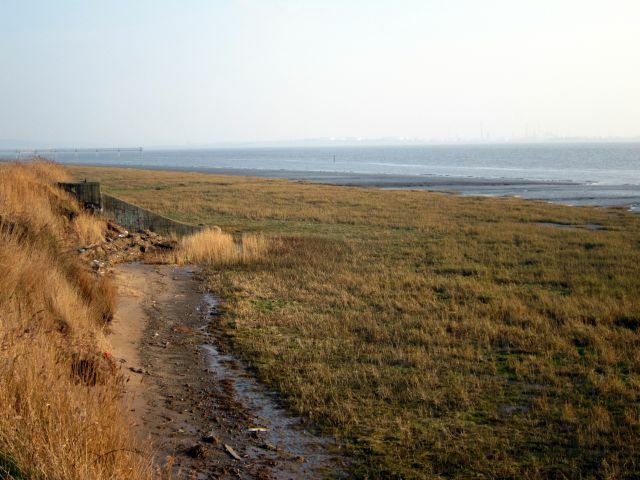 It consists of a stretch of the estuary shore from Garston Docks to Speke Hall. The hi-tech office and warehouse blocks of the Estuary Business Park are never out of sight, but from the footpaths and cycle trails that wend their way through meadows and banks of tall reeds alongside the river there are fine views over the Mersey and the silence is broken only by the calls of sea birds and waders – and the occasional plane making its approach to John Lennon Airport. This may be the edgelands, described by Marion Shoard (who coined the term) as a terrain of ‘rubbish tips and warehouses, superstores and derelict industrial plant, office parks and gypsy encampments, golf courses, allotments and fragmented, frequently scruffy, farmland’. 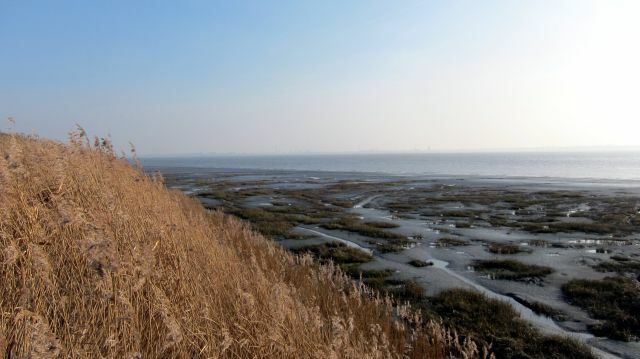 Raggedy, it may be, but it is peaceful, and the mix of saltmarsh, tidal mudflats, grassland, reedbeds, farmland and wildflower meadows attracts birds of great number and variety. No wonder the area is popular with bird watchers. I could hear them (the birds, that is) – but, apart from the familiar cry of Oystercatchers, I wasn’t sure what I was hearing. However, the RSPB and bird bloggers report that along this shore can routinely be seen plenty of the common wader species: Dunlin, Oystercatcher, Curlew, Bar-Tailed Godwit, Knot, Redshank, and Snipe together with Teal, Mallard, Shelduck, Grey Heron, and Cormorant. 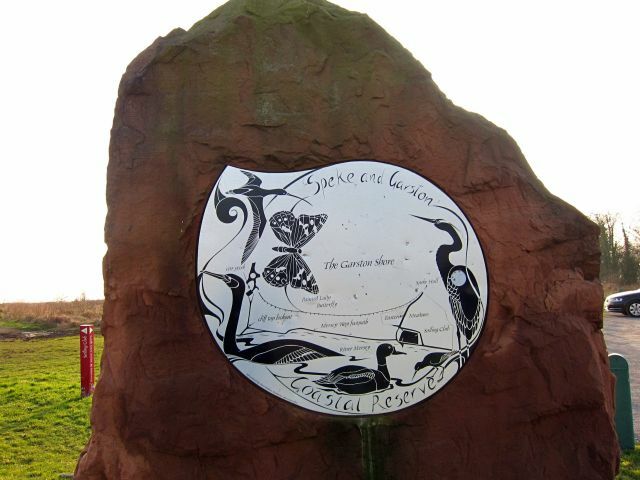 I walked out from the car park at the roundabout on Blackburne Street where sandstone marker stones with plaques that announce the Coastal Reserve suggest ambitious plans a few years back when the Business Park first opened. If there were plans, it looks like they were abandoned soon after: the car park is deeply pot-holed and the the sandstone boulders covered in graffiti. I walked southwest, towards Speke Hall. 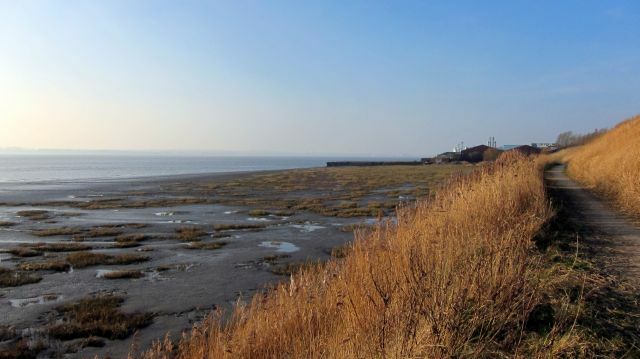 If you are walking the shoreline path (now designated the Mersey Way) in the other direction, this as far as you can go: Garston Docks and the private residential Grassendale and Cressington Esplanades prevent public access to the riverside. The docks I can understand, but as a freeborn Englishman I can’t understand the idea that a private estate should have the right to deny people access to a great river. 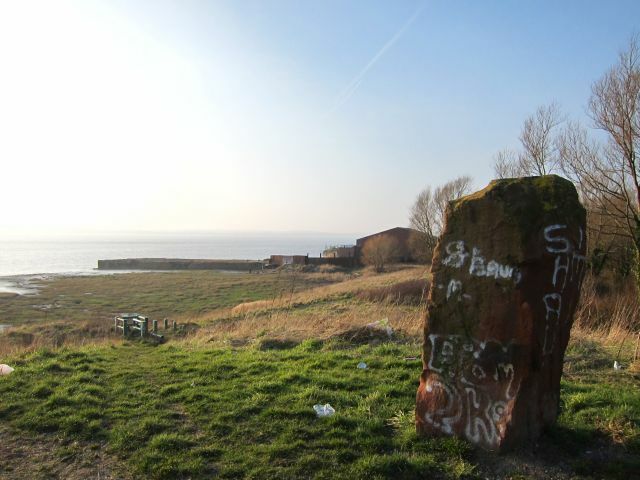 The boundary of the Garston docks is marked here by an old sandstone jetty and tin-roofed warehouse. 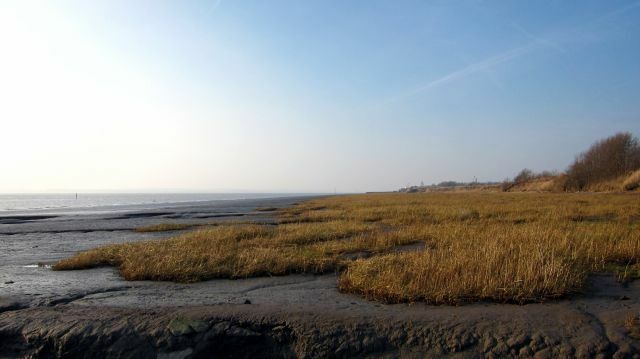 The tide was out and the mud flats glistened in the brilliant sunshine. 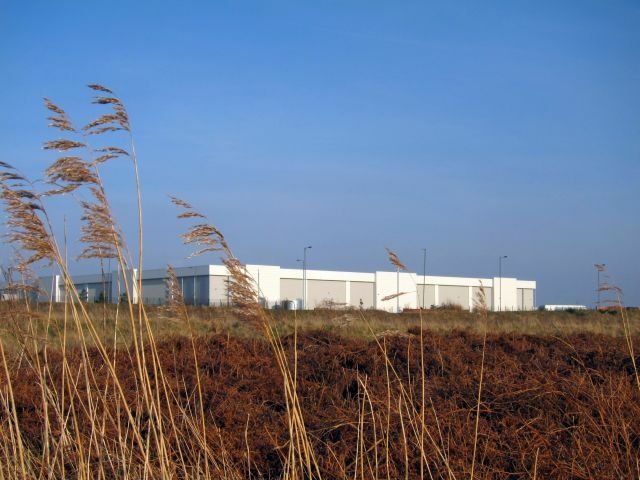 Inland, across the strip of rough grassland, the new low-level office blocks and company headquarters of the Business Park gleamed white and silver. 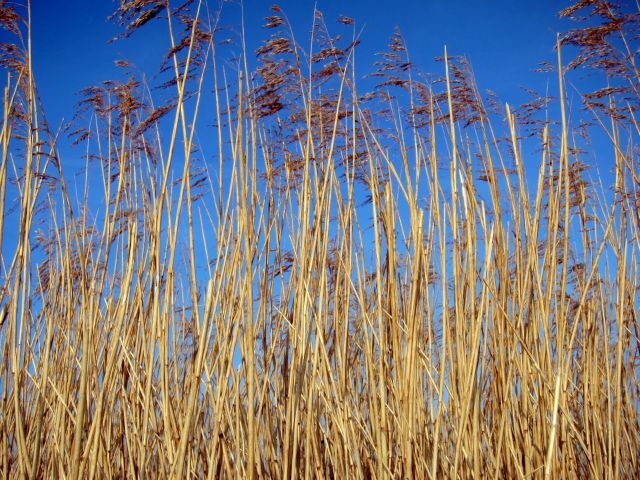 The path was fringed with tall reeds in winter colours of gold and brown. 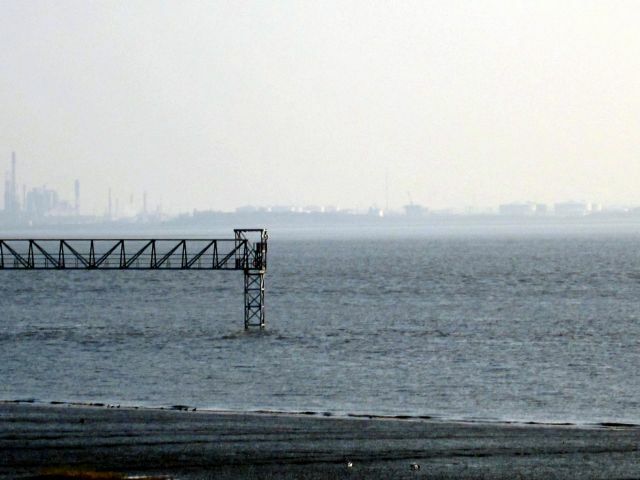 Across the river, the stacks of Stanlow oil refinery gleamed through the haze. There were few around apart from one or two people walking dogs and a couple of guys with a van beachcombing: hauling huge driftwood timbers up from the mud flats. But there were birds – lots of them, a constant background chorus of cries and calls. It’s this haunting, slightly disorientating juxtaposition of the natural and the ordered, the sublime and the unlovely that marks out the edgelands. 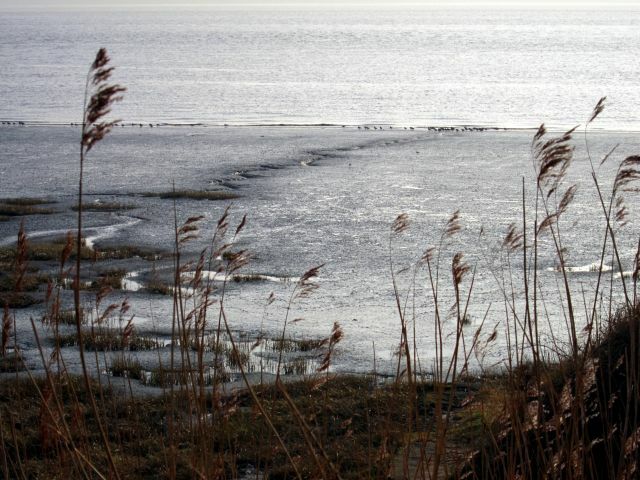 Here were mysterious concrete structures and piles of rubble – left-overs from the old airport site presumably – amidst the reeds and wild flower seed heads. Look one way, and the land had a half-abandoned feel; look the other way and there were the pristine new buildings of the Business Park. ‘As difficult to pin down as poetry’ they write: decay and stasis, but also dynamic and deeply mysterious. ‘Edgelands are always on the move’: true here, where I’m walking on the landscaped rubble of the old 1930s airport (a few streets away, the elegant 1930s terminal building is now the Crowne Plaza Hotel), while behind me the clean lines of Estuary Park’s new office blocks coruscate in the low winter sun. Some of the Park boulevards I drove along to get here are so new they don’t show up on Google Maps. 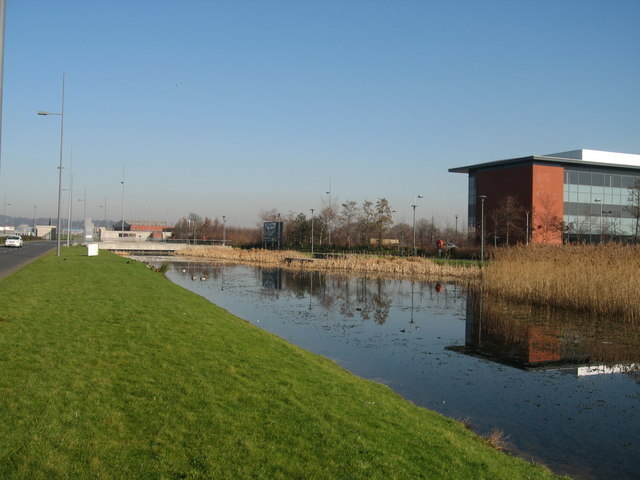 The approach is landscaped in the way of business parks that aim to attract prestigious, high-tech companies: manicured lawns and reed-fringed lakes. Somewhere in the hollows and spaces between our carefully-managed wilderness areas and the creeping, flattening effects of global capitalism, there are still places where an overlooked England truly exists; places where the city’s dirty secrets are laid bare and successive human utilities scar the earth or stand cheek by jowl with one another; complicated, unexamined places that thrive on disregard. 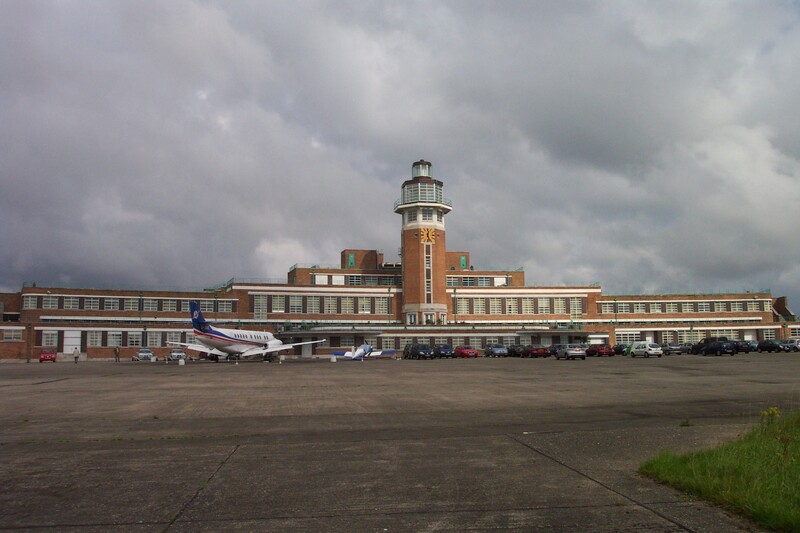 I walked as far as the lighting gantry that juts out into the Mersey and which, at night, guides the planes into John Lennon airport. This was the end of the last walk I did along the Oglet shore last August. 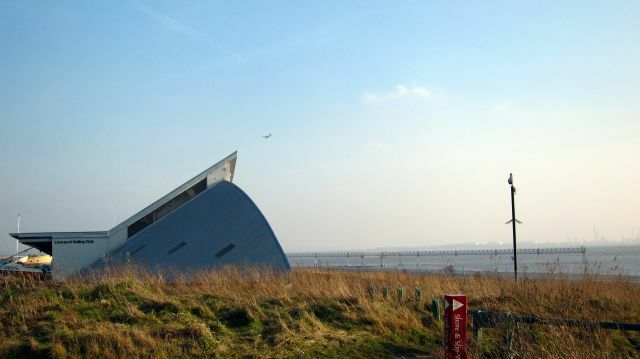 Before I reached the gantry I passed the Liverpool Sailing Club, housed in a remarkable (and, I thought, quite beautiful) building shaped in the form of the billowing sail of a yacht. 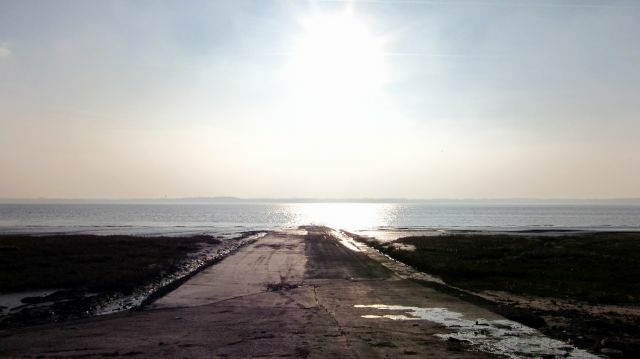 The Club’s concrete slipway provides the only access for sailing boats to the Mersey from the north shore. On the contrary, they seem desolate, forsaken and unconnected even to their own elements let alone to our preferred version of human life. Tidiness is absent: here no neat manicured lawns with sharply demarcated edges are found. If there is grassland, it is likely to be coarse and shaggy. … swamped by a riot of wild, invasive plants that seem to over-run everything in their path: fragments of tarmac, wrecks of cars and derelict buildings. There is a wild beauty here, something to be treasured so near to the city. This is a revelation – what a stunning area, and I agree it is outrageous for any to be removed from public access by housing developments. I really enjpyed the piece and I think that the edgelands term depicts the feeling of apparent abandon and proximate intimacy that you can sense on walks like this one – which in this form, I haven’t undertaken but in another, the one referred to in the ‘growing up’ mention, I certainly have, albeit, a bot north of there, on the Crosby-Freshfield-Formby seafronting domains. That was in the mid- to late ’50’s and the sense described here quite vividly recreates that postwar, less developed, period there. There was still an artillery emplacement (in case Jerry opted to venture into the estuary) on the dunes overlooking the shore, emanating that abandon you saw in the old aerodrome fixtures (of nearly all happy memory but see the death of the ‘birdman’, Leo Valentin at Speke; I was there (at http://en.wikipedia.org/wiki/L%C3%A9o_Valentin) . Lovely to read all that stuff and PURE nostalgia as I have been living for the last 45 years in Venezuela. Where the shores are different, as it were. Thank you kindly. Cheers, John. You’re right – growing up as a kid in the fifties was to absorb edgeland genes, I think. Our school playing field was bordered by a semi-circle of sealed-up bomb shelters and the paths and fields around the village were littered with the remains of a mining industry that had died in the 1930s. Even as a child, there was a mysterious, evocative sadness in the seeing these leftovers from another time, another reality. Really good post thanks. It’s often these raggedy areas which are better for wildlife, as they are quite messy – and will probably be increasingly important along with peoples gardens as agriculture gets more and more industrialised because of food shortfalls. Round here, lots of old herb rich meadows are being ploughed up and reseeded with rye grass – a green teletubby desert which supports very little life, apart from the dairy cows. I wish it weren’t so and we’re trying to do our bit with a little piece of land. I hadn’t heard of the books, more for the list! And while I’m here……..since reading your original piece I sought out the coastal park (which I’d never heard of – it’s all of three miles from home!). We went there again this morning at a very low tide, and the mudflats were astonishing – it looked like a lost world under the river. Any more hidden gems, Gerry? Cheers, Pete. I suppose you know the Oggy shore? 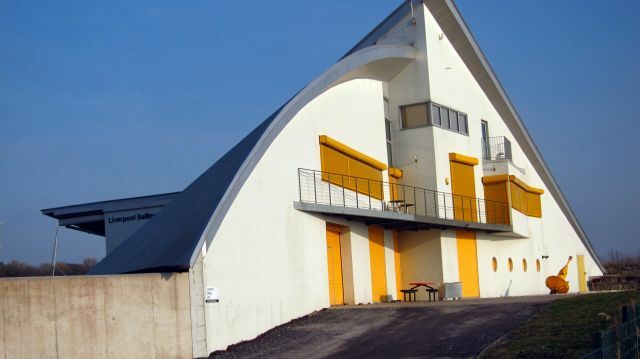 (http://wp.me/poJrg-30v). Or, slightly different but still Mersey-related, after we got our allotment at Dingle Vale and realising that this was where the Dingle actually ran down to the Mersey, I found out a bit about its history (http://wp.me/poJrg-1kr). Yes, the Oglet’s one of our standard strolls when we don’t want to go far. Thanks for the other link – fascinating stuff. Offf topic completely, I found out recently that your daughter teaches Sue Ryrie’s grandson! The Liverpool village! Hi, great piece of writing to describe the type of experience we are looking to create at the Coastal Reserve. 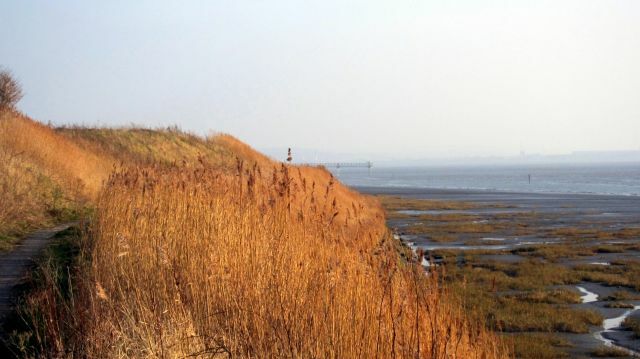 This is not meant to be the manicured experience that is Otterspool or Sefton Park, but a bit of wilderness on the shoreline that people in their dozens, not millions can enjoy! We have just finished the final stretch of ‘pathways’ that link Speke Hall with the Reserve so people living in Speke or Garston can access Speke Hall free and enjoy the Reserve by parking in the Trusts car park and walking through the grounds. I hope you enjoy the experience. That’s good news, Rob. Thanks for reading and for for your generous comment. Best wishes, Jason. I hope your act of remembrance goes well.